LICHTSINN RV RECOGNIZED AS #1 WINNEBAGO MOTORHOME DEALER IN NORTH AMERICA FOR 4TH CONSECUTIVE YEAR! 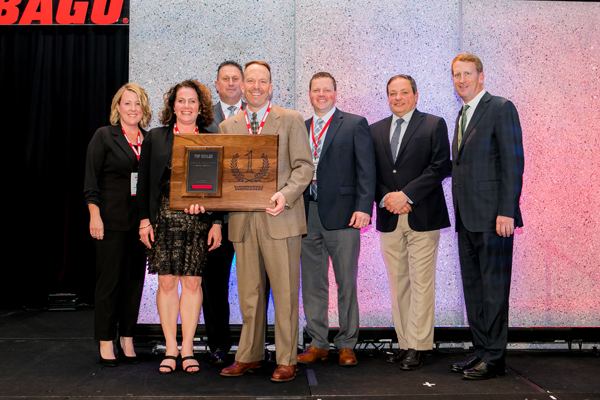 Lichtsinn RV has been recognized as the #1 Winnebago dealer, single-location, in North America for 2017- 2018 by Winnebago Industries, Inc. at the Winnebago Redefined Dealer Meeting. Lichtsinn RV has received this award for the last four years. Lichtsinn RV accepts Top Winnebago Motorhome Dealer Award (pictured left to right) – Heidi Thompson, Vice President and General Manager, Lichtsinn RV; Hope Lichtsinn, Owner, Lichtsinn RV; Niles Whitehouse, Director of Product Management, Winnebago Industries; Ron Lichtsinn, Owner, Lichtsinn RV; Ryan Roske, Director of Product Management, Winnebago Industries; Russ Garfin, Director of Product Management; and Brian Hazelton, Vice President and General Manager – Motorhome Business. Winnebago Industries also named Lichtsinn RV as the #1 Dealer of Class B motorhomes, #1 Dealer of Class C motorhomes, top 2 dealer for Class A Diesel, and a top 5 dealer for Class A Gas in North America. In 2014, Lichtsinn RV built a new, state-of-the-art RV dealership and continued expansion and boasting 8 RV service bays for their service guests. The new facility includes a large indoor RV parts and camping accessories store, a spacious service check-in area, a video production studio, indoor delivery and service drive area, and a guest lounge equipped with the latest technology. Lichtsinn RV also offers dealership guests complimentary electrical and water hookups while visiting for RV delivery or service. Lichtsinn RV sells new Winnebago and Winnebago Touring Coach motorhomes, carries an extensive pre-owned inventory and offers seasonal RV rentals. Lichtsinn RV is the largest Winnebago parts dealer in the United States and provides service to guests from all over the United States and Canada. Lichtsinn RV is the #1 Winnebago Motorhome Dealer in North America for the past 4 consecutive years, as awarded by Winnebago Industries.